While spinning this weekend, my mind wandered. I have a knitting project in the basket, a tatted doily in process, and two warps on the loom. My husband teases that I’m an incurable multi-tasker. Why do I always have to have multiple projects going, in different crafts? Where did it all start? First, crocheting came to mind. I admired the doilies my mother and grandmothers made and wanted to make some of those. But yarn is easier to learn on than crochet cotton, so I started with granny squares. In high school, I made a few granny square purses for classmates and sold a few. Nothing fancy, but in perfect step with the styles of the early 70’s. But it goes further back than that. When I joined 4-H as a 9-year-old, one of my first “projects” was Knitting. I remember our leader patiently teaching several of us around her kitchen table in the evening meetings. She must have been a saint because there was only one of her and at least 9 or 10 of us, but learn we did. My Dad’s slippers didn’t quite turn out—I’ve always knit large and he wasn’t really a slipper-wearer, but he was a good sport! But maybe it went back even further. When I was 7 or 8, trolls were a fad. They came with all colors of hair. Mine had orange hair. And you could make simple felt outfits for them. 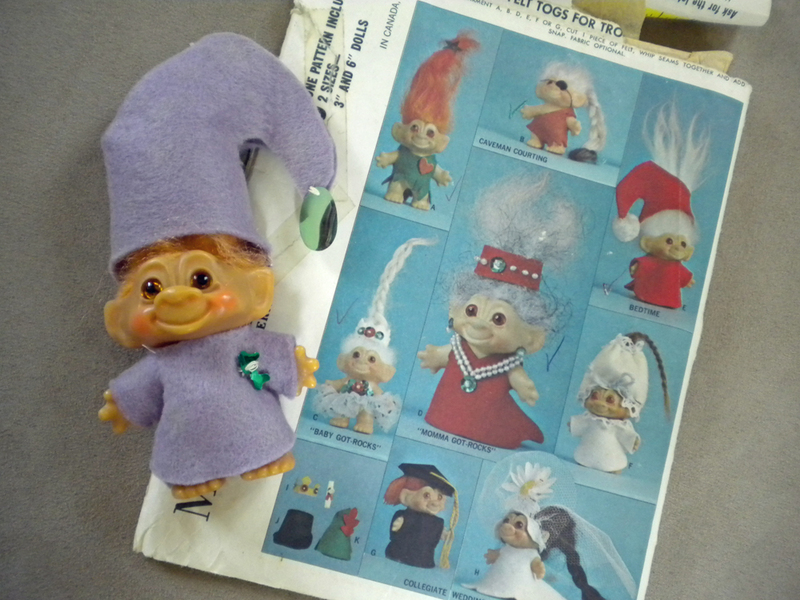 My Mom purchased a sewing pattern for a variety of outfits, sat down with my sister and me and taught us the basics of sewing outfits for our trolls. Again, nothing fancy, but we were proud of the clothes we fashioned ourselves. In the intervening years, I’ve added tatting, spinning, and weaving to my craft skills. Each brings its own pleasure and satisfies the need to always have something in my hands. I am so grateful to all those who patiently taught me skills that bring such joy. And it’s my turn to pass along the joy! 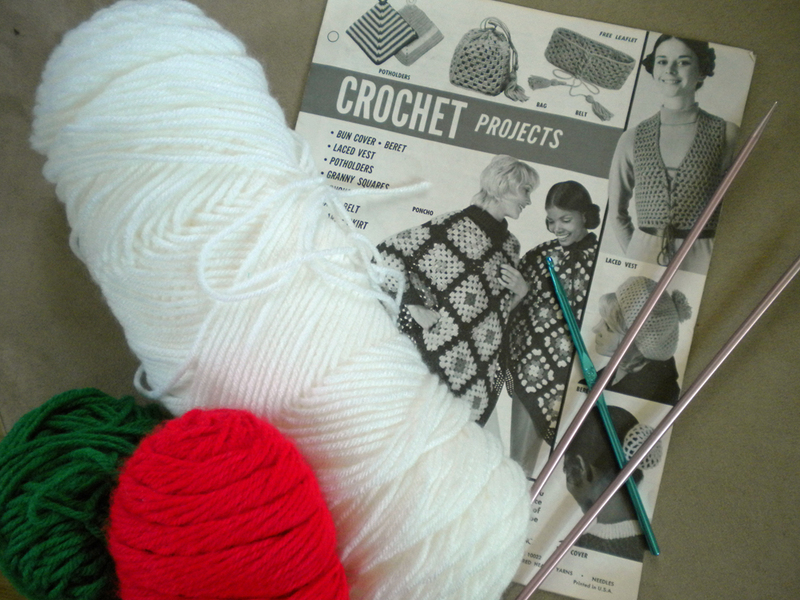 We must be about the same age–trolls and granny-square purses figure in my past, too! I can think back to my own very early experiences with fiber crafts, too–embroidery, being taught to braid, watching my mother make our clothes. I do think those early lessons have shaped my interests my whole life! Ah yes, embroidery too! I have my first dresser scarf embroidered with (very uneven) bluebirds. It is roughly hemmed because I just wanted to finish it already. And the cross stitch gingham apron that still isn’t finished. When my kids were little, I wanted them to want to learn crafts, so I didn’t force them to sit down and learn. And now none of them take needle in hand. I wish I had been a little more coaxing so they would know how satisfying it is to see color and form from the hand. God bless our teachers!